Tomorrow (Jan. 16) I will testify before the Senate Finance Committee about the harm that fast track and the Trans-Pacific Partnership will do to our values as a nation. Of the four witnesses that will speak at the hearing, I will be the only one speaking out against fast track and the TPP. My voice at this hearing is your voice. You can learn more about what is at stake and watch the hearing live tomorrow at 10 a.m. (EST) at www.cwa-union.org/tpp-hearing. Our core values – democracy, economic justice, secure sustainable jobs, consumer and environmental protection – must be enshrined in our trade agreements. We cannot delegate the responsibility to achieve these goals to secret negotiations like the ones that have been held for the TPP. We must not use fast track to push trade agreements through Congress without meaningful debate on whether or not those agreements reflect our values as a nation and will improve conditions for American workers. Watch the hearing live tomorrow at 10 am at www.cwa-union.org/tpp-hearing. The Trans-Pacific Partnership is a massive, secret trade deal that’s being negotiated among 12 countries on both sides of the Pacific Ocean. Participating in the talks now are representatives from the U.S., Australia, Canada, Japan, Malaysia, Mexico, New Zealand, Peru, Chile, Brunei, Singapore and Vietnam. Countries like the Philippines and South Korea also have indicated they want to join. 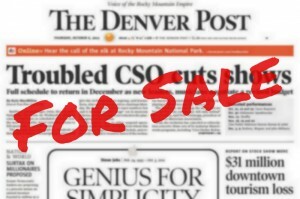 Negotiations have been going on behind closed doors for more than three years and are nearing their end. The round in Salt Lake City in November was the most secretive yet, with only chief negotiators and “experts” allowed to be part of the discussion. The latest round took place this month in Singapore. About 600 U.S. corporate lobbyists are acting as official advisors and working with the Office of the U.S. Trade Representative. They are making huge decisions about jobs and workers’ rights, environmental standards, food safety, patents and intellectual property rights and so much more, and all in secret. The agreement then must be approved by all participating countries. For the U.S., that means both the House and Senate must approve the trade deal. The Obama administration and TPP supporters want a process called “fast track authority or Trade Promotion Authority,” which would allow only an up-or-down vote with no amendments to the TPP. CWA and our coalition allies are fighting hard to stop fast track. It’s a fight we can win. Top Secret MeetingWhy all the secrecy? 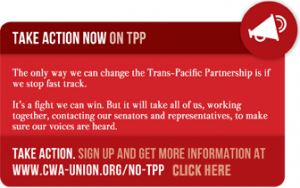 Why aren’t we hearing about what TPP would do? Because U.S. corporations desperately want this deal, and they know that it’s a corporate and Wall Street giveaway. The TPP is much more than a “free-trade” agreement. It’s designed to make the world safe for corporate investment and profits by reducing labor costs and undercutting workers’ rights; dismantling labor, environmental, health and financial laws and regulations that could affect profits; and setting up a process to resolve any disputes by going through special international tribunals rather than our own court system. Take ActionU.S. workers are on to the fact that trade deals like the North American Free Trade Agreement, the U.S.-Korea Free Trade Agreement, trade deals with Peru, Colombia, Panama, and now TPP benefit the 1 percent at the expense of the rest of us. Workers’ jobs go overseas as corporations chase subsistence wages, like Vietnam’s 25 cents an hour, and seek out places with little or no regulation. What we do know, through leaks of the various chapters, is that TPP is a bad deal for workers in every country. That’s why CWA has joined together with our coalition partners – Sierra Club, Citizens Trade Campaign, Public Citizen and others – to stop this attack on working conditions. None of us can win this fight alone. But together we can stand up and fight back.